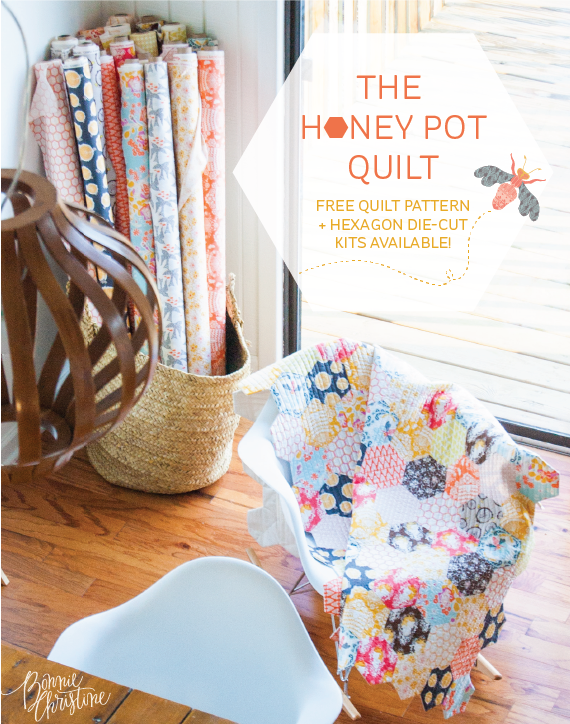 the honey pot quilt - free quilt pattern + kits available! : going home to roost the honey pot quilt - free quilt pattern + kits available! hello, loves! i'm so pleased to share with you the quilt for my latest fabric collection, sweet as honey. the honey pot quilt is a free pattern (click here to download) that goes together quickly with machine piecing and no binding. because this design keeps the integrity of the hexagon shapes around the edges, the finished look is both unique and stunning. the finished size of the quilt is 65" x 70" - perfect for your sofa or afternoon picnic! in addition to the free quilt pattern, we're so excited to also offer die-cut hexagon kits that include all 260 hexagons! both colorways are offered, spring harvest and autumn harvest. purchasing the kit let's you skip all the tedious hexagon cutting and let's you get right to the fun part- sewing! the honey pot quilt kits include all the hexagons needed for the quilt, as well as the pattern and a die cut template for marking the sewing dots. visit a stitch in time to see more and grab your kit! click on the image above to download the free project sheet for the honey pot quilt. This is such a beautiful quilt…. I can’t imagine ever having time to quilt again now that our little Lexi Lou is here, but if I do I’m bookmarking this one! I love everything about all of this. Love the quilt! But a couple questions. Pattern says to lay the backing right side up but I don’t see where you would turn the quilt inside out. Did you mean for the backing to be right side down? Because you don’t turn it inside out and you quilt it. Lastly, so I understand, when you turn the facing to the back does that then create a border around the edge of the quilt? If so, that sounds very cool looking when the backing and facing are different fabrics. hi patti! thank you, i’m so happy you like the quilt! i was able to go in to the pattern and do some figuring. you’re right, it should say wrong side up. so sorry about that! and yes, when you turn the facing it creates a border! as we went through again, we also noticed that after figure #4, it should say sew row #1 to row #2 (not #1 again). we’ll make these correction asap, but just wanted to let you know. thank you so much and happy sewing!